County locations are more clearly marked throughout Scythebill, which helps disambiguate "Los Angeles" (the city) from "Los Angeles" (the county), and so forth. I've fixed up a couple of IOC mappings, most particularly for the "poensis" subspecies of Western Barn Owl. There's the usual batch of checklist tweaks, most particularly for Mauritania. ... and some smaller things you might not notice. ORIGINAL NOTE: Scythebill 12.9 is here! As always, download here, and let me know if you have any problems, either on Google+, Facebook, or by email. This version includes the just-released IOC 6.2 taxonomy, support for importing Avisys Field Notes, international names for the eBird/Clements taxonomy, and more! The IOC 6.2 taxonomy was finalized yesterday, and Scythebill already supports it, including updates to all Scythebill checklists! You can get a full list of species-level changes - mostly splits in Cuckoo-Doves and (Australasian) Catbirds. They've also mercifully restored "Diademed Sandpiper-Plover" to its rightful full name and made a lot of passerine subspecies changes. Avisys let users store "field notes" - free-form text like Scythebill's "Notes' field. But those notes never made it to the exports file, so Scythebill has been blind to them. New in 12.9, Scythebill lets you import Field Notes too. The process is a bit more involved (five more steps than an import without them), since you need to make Avisys produce a second file containing the field notes, then give both files to Scythebill. The Scythebill manual has already been updated. Please let me know if you have any problems with this new feature, or if the directions are at all unclear! Scythebill 11 added support for international names in the IOC taxonomy. 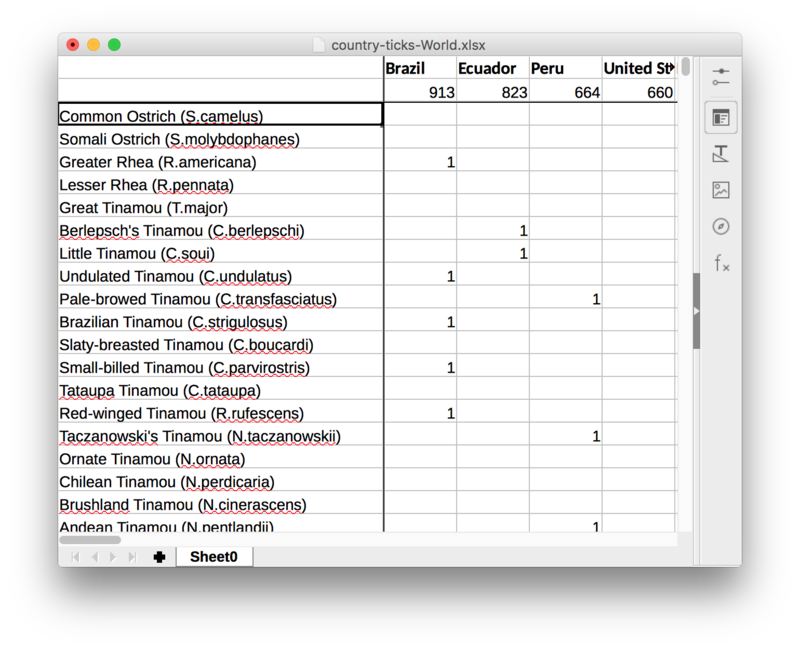 Scythebill 12.9 adds support for international names in the eBird/Clements taxonomy! You can now pick from 42 different sets of international eBird/Clements names, including 6 different English options and 11 different Spanish options. Visit the eBird page about Common Name Translations in eBird to find out more. To set this, just visit the Preferences page and choose the new Species names (eBird/Clements) preference. There's now a checklist for Kosovo, courtesy of courtesy of Qenan Maxhuni! There's also a bunch of first-country records, many courtesy of the new Facebook Global Rare Bird Alert group. Scythebill will now detect and warn you if you've set the Scythebill font size large enough that critical parts of the page are offscreen. Scythebill now has a number of additional "- in part" alternate names; as a practical effect, this helps Scythebill do a better job importing some recent splits, e.g. it can automatically import "Common Kestrel" in South Africa as Rock Kestrel. There's also now a new "magic" location in Show reports - "Ireland (Island of)" - which will include sightings in either the Republic of Ireland or Northern Ireland.